Aqueductal stenosis is a common cause of obstructive (non-communicating) hydrocephalus. 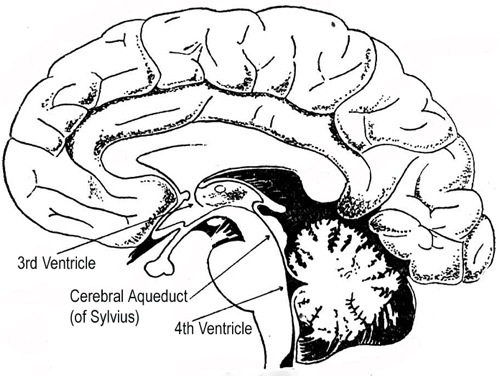 The cerebral aqueduct (of Sylvius) is a narrow channel that connects two of the ventricles (fluid-filled chambers within the brain) and passes through the midbrain. Normal cerebrospinal fluid dynamics require an open aqueduct so that fluid can flow freely through this area. If the aqueduct is blocked, this is called stenosis and can lead to the symptoms of hydrocephalus. Congenital: Some patients are born with a congenitally narrow or completely obstructed aqueduct. I complete, this usually presents as pediatric hydrocephalus. However, if the obstruction is more minor, the patient may be asymptomatic or may not present until older age. The obstruction can appear as a general narrowing of the aqueduct or can appear as small webs or rings of tissue across the channel. Post-Infectious or Post-Hemorrhage: Infection in the cerebrospinal fluid or hemorrhage into the ventricles from other causes can occasionally lead to scarring that creates webs or rings that cause aqueductal stenosis and block flow through the aqueduct. Idiopathic Acquired: Some patients present in adulthood with the new onset or gradual onset of hydrocephalus. In many cases it is unclear what the underlying cause of the stenosis was and is considered idiopathic (in other words, we do not know the cause). Tumor-Associated Non-Communicating Hydrocephalus: Blockage of the cerebral aqueduct can occur from a brain tumor in the region of the midbrain, the part of the brain through which the aqueduct passes. Most commonly this occurs due to a tumor of the pineal region, such as a pineoblastoma, pineocytoma or pineal germinoma. Because the pineal region lies just behind the midbrain at the level of the cerebral aqueduct, as these tumors expand they can externally compress and eventually obstruct the aqueduct. Likewise, tumors within the midbrain itself at this level (such as a glioma, for example) can compress the aqueduct. The onset of symptoms due to aqueductal stenosis varies depending on the specific cause and type of obstruction. However, generally the symptoms are those that are typical to hydrocephalus of any cause, such as headache, nausea and/or vomiting and eventually deterioration of the level of consciousness leading to coma and death if severe and not treated. Some patients may also experience visual symptoms such as dysconjugate gaze or worsening of visual acuity with chronic hydrocephalus. These symptoms can all be accompanied by other neurological symptoms if the cause of the obstruction is a tumor which affects other parts of the nervous system. In a patient who presents with symptoms typical of hydrocephalus, a complete neurological assessment is generally performed. This generally includes an imaging study such as a CT scan or MRI scan. While a CT can demonstrate hydrocephalus, it is less effective at delineating the cause of the hydrocephalus in some cases. However, stenosis of the aqueduct typically causes tri-ventricular hydrocephalus, enlargement of the lateral and 3rd ventricles with a normal appearing 4th ventricle. This pattern is usually consistent with some obstruction at the level of the aqueduct. An MRI can clearly show a tumor as well as enlargement of the ventricles. Also, some specific forms of MRI (called CISS or FIESTA scans) are very sensitive for demonstrating subtle abnormalities such as narrowing of the aqueduct or an aqueductal web causing aqueductal stenosis. Treatment of aqueductal stenosis varies from patient to patient depending on many factors. However, in general the treatment of hydrocephalus in these patients is the same as for any cause of obstructive hydrocephalus. For symptomatic patients, in general this means diverting the flow of cerebrospinal fluid with either a shunt procedure or endoscopic third ventriculostomy. An exception includes patients with a brain tumor causing obstruction of the aqueduct. These patients may require other surgical or medical treatments for the tumor. In some cases, surgical removal of the mass will relieve the pressure on the aqueduct and reverse the hydrocephalus. In others, despite treatment of the tumor the hydrocephalus may persist and require one of the above treatments for hydrocephalus. Each patient with hydrocephalus and aqueductal stenosis are different and therefore treatment plans cannot be recommended without carefully weighing the specifics of each case. Patients should discuss their appropriate treatment options with their own treating physicians. from the Aqueductal Stenosis page.